The Washington Redskins have been in the news this NFL offseason for many reasons outside of football – well, actually, one main one. Their name. I won’t go too deep into that, but the politicans as well as various organizations have been putting pressure on Washington owner Dan Snyder to change the name. So far not much has happened on that front. Robert Griffin III will be a big piece of the offensive output for Washington football team this season, if fully healthy from his injury. 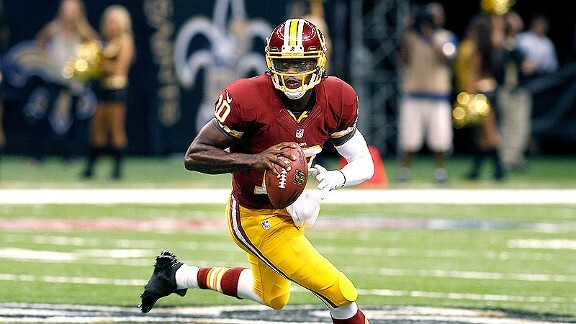 From the actual football side, the team will be hoping that Robert Griffin III, the franchise quarterback going into this third season from Baylor, will be fully recovered from his ACL surgery & be ready to play like the RGIII that was the NFL offensive rookie of the year in 2012 & led Washington to the NFC East Championship. Last season, Griffin struggled with having any kind of real mobility anywhere on the field & it affected his level of play throughout the entire season once teams realized that he had to be a traditional quarterback. The Redskins went 3-13 & Griffin was benched towards the end of the season & Kirk Cousins from Michigan State was the starter & performed very well, which is why I am surprised the team didn’t trade Cousins this offseason. Or maybe new head coach Jay Gruden knew that he needed to stick around in case Griffin isn’t back to his regular form. Griffin will have help in the form of a great running game led by Alfred Morris, who had a great rookie season in 2012 & followed it up with 1275 yards last season, among the best in the NFL. Griffin III & Morris in the backfield with the threat of the run from Griffin will be a great combination to make defenses have to bite one way or another if the formations are predominantly from the spread position. Also on the offense, the team got a big time wide receiver to go deep in DeSean Jackson, who is coming over from the Philadelphia Eagles. Jackson has the ability to take the top of the defense & make huge plays every single game. Jackson, along with Santana Moss, Pierre Garcon & Leonard Hankerson bring together a strong group of receivers that will allow RGIII to not have to make every play on the field, which will make Washington that much more dangerous. On the defensive side of the ball, Washington upgraded their secondary by signing Ryan Clark from the Pittsburgh Steelers. Clark is a great ball-hawking safety with veteran leadership & championship experience. His presence will be great for players such as DeAngelo Hall, who is a veteran cornerback, but hasn’t won much in the league. Strong safety Brandon Meriweather is a great player, but he has a bad reputation for being a head-hunter & unfortunately, he has paid for his actions with concussions in the past, as well as fines & small suspensions from the NFL. Meriweather has to be able to put fear in receivers, but also keep control of his actions when on the field since he is going to be the target of officials. In the linebacking core, Washington looks strong with having Brian Orakpo & Ryan Kerrigan manning the outside positions. The team should be much stronger on the defensive side, possibly being higher than 15th overall in the league. Washington, however, will be a team that may go through some issues getting their team straight after all of the discomfort from last year & the Mike Shanahan regime & getting Jackson used to working with Robert Griffin III. The Redskins look like a 9-7 team & another team that will be in the playoff hunt this year, but in the NFC East, there are no surprises & if the team is as together as they seem to be & if they can get used to Gruden’s philosophy, Washington can mess around & win the division.